Smudging with smudge sticks is one of the best ways to remove negativity, negative forces, and unwanted energies from your home. There are many different ways you can perform a smudging ritual or ceremony on your home that is quick, safe, and effective, however this post will go into just one general ritual that basically anyone can do and use as long as they have the proper smudging materials needed to perform it. The most important thing you will need to begin a smudging ritual for your home will be a smudge stick. 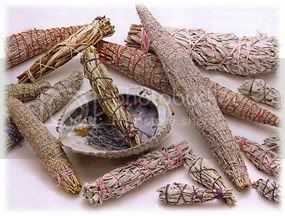 Smudge sticks are normally hand made and rolled, and tightly tied together by yarn or string. 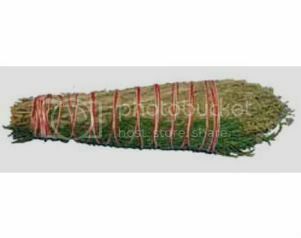 There many different variations, scents, and herbs that are used in the making of a smudge stick, however, sage is the most common one used because sage is one of the most potent negativity killers out there today and has been for hundreds of years. Another added benefit you can have while you are performing your smudging ceremony would be to obtain some incense. Incense comes in many different scents and varieties like smudge sticks, including cones, sticks, and pure natural granular incense. Any of the three will do, however we find that the more natural the better. Natural granular incense however will need to be burned different then cone or sticks. If you are going to use granular incense you will need some charcoal and an incense burner. You light the charcoal first outside the incense burner holding the charcoal with a pair of tongs so you don't get burned. Once the charcoal is lit make sure it is smoking regularly and then place it into your incense burner. Next, place your granular incense ontop of the charcoal and then if you have some sand, or gravel, or small pebbles, you can place this over the charcoal and the incense in a mound shape but ensure the smoke can rise from it. Some scents you can use along with your smudge stick for incense would be sage, cedar, banishing, purification, water(element incense), sweetgrass, copal, dragon's blood, and lavender are some of the most effective. Before you work with your smudge stick, it is best to place whatever incense you are using into each room of the home and let it burn with the windows open if there are windows in that room. Another tool you can use along side your incense and smudge stick would be some gemstones. Gemstones are a powerful tool in cleansing. The energies within the stones can be potent, and depending on the size of the gemstone(the larger the more energy it will have) you can have an amazing purifying source in the gemstones. Some gemstones for purification and cleansing purposes are quartz, citrine, amethyst, and malachite. If you happen to have enough stones place one into every room of your home along side the incense. If you only have one stone or only have the means to have one, then you can carry it with you while you perform the smudging ritual. The first step with this ritual if you have incense in every room would be to light all the incense and make sure they are burning with all the windows you have in your wide open, the curtains and blinds up. The next step is to make sure your gemstones are in place next to your incense. Whenever this particular ritual is performed, it is performed during the day, preferably on a sunny day. The sun and light will help you in this ritual to purge the dark energies and negative forces out of the home. When you have that all completed, the next step is to go to your front door and hold your smudge stick in your dominate hand. Next, light the smudge stick and let it smolder and smoke real good. The best way to light a smudge stick is to use an enlongated lighter that you would use to light candles or pilot lights in stoves. This is my sacred place and you will obay"
Again this is just an example, you can use your own or this one, whichever you prefer. Once you are done with that room, go on to the next room, and the next, until every room in your house is fully covered. Ensure that you hit every corner of each room, and make sure the smudge stick is smoldering and smoking. If it begins to die out then relight it with your lighter. You being the smudging ritual at the front door of your home, and you end it at the back door. If you wish once you have finished going from front to back, you can go back through again starting at the back door and then going to the front door. This is important. Properly closing out your ritual can be vital to ensure the energy you put into it worked. For this ritual the proper way to close would be to first put out the smoldering smudge stick or you can let it burn itself out. One way of putting out a smoking smudge stick would be to get an ash tray, or ceramic plate, or something similar and gently dab the lit end onto it like putting out a cigarette. Another way would be to simply place it onto something where it won't fall and let it burn out on its own(they usually do). Once your smudge stick is out, let your incense burn out on its own naturally. If you are using gemstones an idea to close the ritual with even more positive energy would be to take an altar bell(or any bell if you have one) and gently ring it right above the stone. The ringing of the bell will send vibrations into the stone and this will trigger the gemstone to release it's energies into the room. If you do not have an altar bell, you can get a glass and a fork and gently ding the glass with the fork over the gemstone as well. If you do not have gemstones in every room and only have the one you were carrying around with you, take the gemstone and perform the above with the chiming technique and then place the stone by your bed or under your pillow. If you have performed everything mentioned within this post you will have yourself one purified and blessed home for quite a while. You can re-do this ritual every six months or as needed. The incense and stones are just extra benefits to the ritual, however the smudge stick is essential. If you cannot or do not want to use the incense or gemstones, ensure you walk through your home and say the prayer with your smudge stick as mentioned. Thank you so very much for your help with smudging.I have been experimenting with smudging but I was rather worried I would bring in the bad spirits which I don't need.Again thank you.God Bless you. It's all a bit cuckoo to me, I'm afraid. What in fact is happening is that you are trying to give rationality to something which on the surface might appear ceremonial, but essentially is has as much relevance as wiping a surface with a wet cloth or sweeping a room. 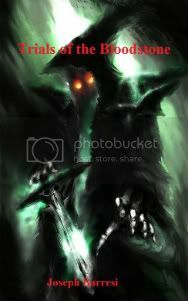 Methinks is the haven of lost, lonely souls. I need to purify tools and space so I can launch a servitor. is it ok to use smudging to do so or do I need something industrial strength?